Benjamin is just a fabulous teacher. He’s energetic, he explains things well, and he even tries to be funny. He doesn’t always succeed, but just hearing him laugh at things makes you laugh too. I really enjoyed this course. 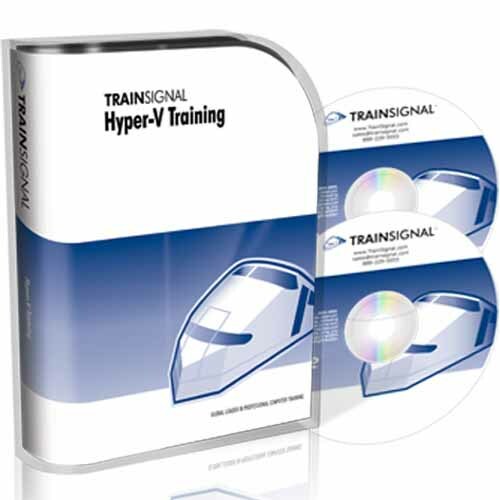 This course gets you into some serious Hyper-V topics though. Everything from the basics to advanced deployment and management topics is covered. And since I wrote about them last time, TrainSignal now has online streaming courses so you don’t have to mess with physical media. I reviewed the online version and it’s just beautiful. It streams very well and it’s always easy to find where you were before. I actually found that I’m more pleased with the online version than I am with the DVDs. This one is kind of a gimme because it just introduces the course. Here you get into what Hyper-V is, installing it, and a discussion about virtualization. You’ll also get some guidance on when you should use it. In this lesson you’ll setup your first VM going step by step with Benjamin. You’ll create a simple machine, add RAM, disk, and even create a snapshot. This lesson explains virtual networks and this was one of the breakthrough lessons for me. I had never done much with virtual networks, but now I’m ready to jump in and start sophisticating my VM scenarios, and this lesson showed me how to do it. Here you get into the types of disks. This lesson introduced me to differencing disks, which is the fastest way to deploy a VM possible. In a differencing disk you create a base image, and then create all the other VMs off of that image. The new VMs only store differences between the two. This way you can save a lot of space on your VM host. Now we’re getting into WDS (Windows Deployment Services) and while I don’t use it myself, I know plenty of Windows admins who do and this chapter will come in quite handy for them. I can speak the language now and if I ever do need this, then I’ll know right where to come. Importing and exporting VMs is covered here. This is a great topic that never gets much play so I’m glad it’s included here. Here you’re learning about remote access. Things like firewall settings, HVRemote, and other security topics are covered. I guess you could consider this the meat of the course. Here you’re going to setup a complete domain in a private network. I have already setup a couple following the instructions here and it’s excellent instruction. Here you cover R2 enhancements and upgrade. Now you get into new R2 features. This is an incredible lesson. Here you’re getting into building a virtual cluster and he shows you everything from basic clustering to attaching the iSCSI disks. You also get into live migration. HA is an important topic and for those of us who need to test certain aspects of clustering, this is a much needed chapter. Finally, running SQL Server in Hyper-V is covered. I actually know quite a bit about this topic so it isn’t something that I got a lot out of, but Windows admins with little to no SQL Server experience will get their feet wet quite well. There’s no way around it, this course is awesome. I’ve been reviewing training material for a long time now and I find every vendor has some inconsistencies in the quality of their training. And while TrainSignal has had some of that in the past, this is definitely one of their better ones. The topic is relevant, and the lessons never stray from what’s promised. Benjamin explains things very well and he’s clearly a real expert in the subject matter. I learned more in this training course than I have in quite some time. Copyright © 2019 itbookworm.com. All Rights Reserved.